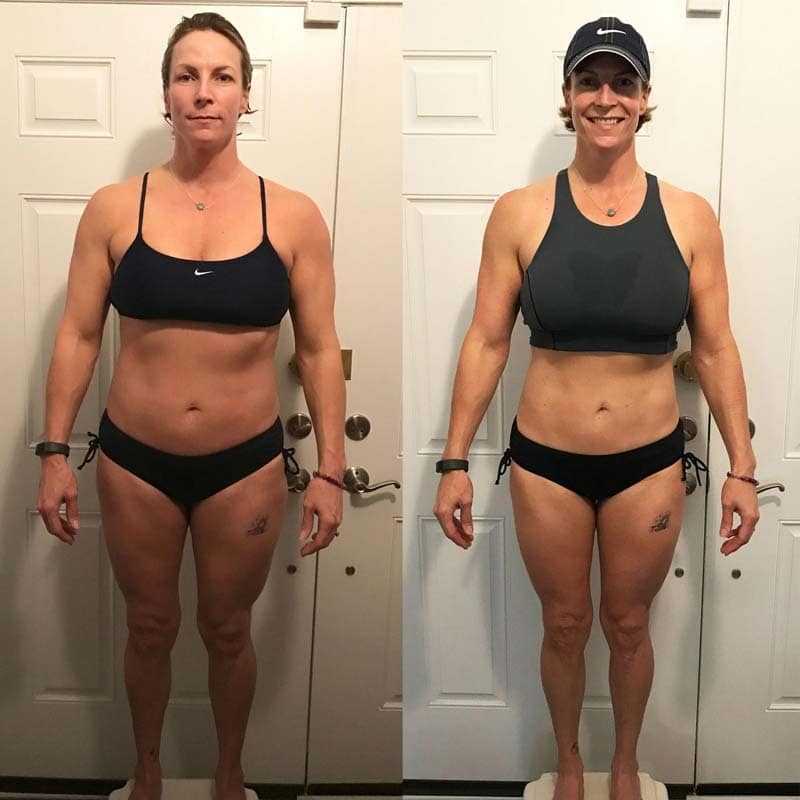 Overcoming chronic back pain, Nurse Anesthetist Courtney Mullaney, 48, made an entire lifestyle change to take her body and her health to new heights in 8 weeks of Online Personal Training! I was born and raised in Baltimore, Maryland and moved to Myrtle Beach, SC in 2015. My husband, George, and I have been married for 17 years and have a 14 year old Weimaraner named Madisen. We also have 4 cool cats. I work full time as a Nurse Anesthetist and love my job. We both work out (not together, lol) and enjoy spending time with our friends here and going up to Balto. to visit friends and family. I made an entire lifestyle change in the last 8 weeks. I am in the kitchen prepping meals every Sunday. I make time for my workouts and made sure my husband was totally on board. Gone are the days of eating out 5 days a week. Yes, it was 5 days/week. My husband and I are very social. We love to go out (and still do), but my friends are really understanding of my goals. I may have the occasional drink, but it’s planned around my cheat meal. Key word is “planned”. I also have “mocktails” made with club soda. I have lost several inches in my waist and chest. I’m down 12 pounds. The turnaround for me was asking Julie Lohre for help. I had been spinning my wheels for far too long so I emailed Julie. She called me and we talked for a bit. She spelled out what we needed to do to get where we wanted to be. I say “we” because we are a team. Julie Lohre is there every step of the way for me. Julie Lohre made a customized workout and nutrition program, taking my prior injuries into consideration. I knew the workouts would be no problem; it was the nutrition that I worried about but Julie made a plan that fit into my lifestyle and it’s working. I am not deprived. My macros have increased each time which has my metabolism fired up. I have a horrible sweet tooth and Julie has been able to re-create all the favorites with UMP protein powder. Those have saved me. My upper body strength has really improved over the last 8 weeks. My pushups have increased. I have increased my overhead DB presses and bent over rows by 10 lbs. My reach test has increased 2 inches. Two inches may not seem like much, but this is coming from someone who severely lacks lower back/hamstring flexibility. I never was one to train my core so sit ups and planks have become much easier. Four weeks ago I could do 3 rounds of endurance training and now I am up to 4. 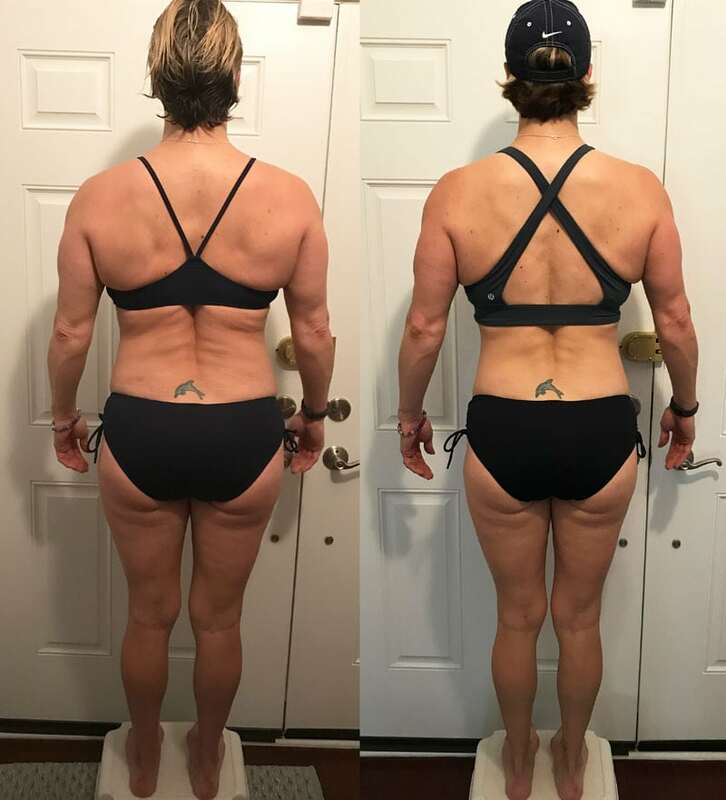 Courtney’s 8 Week Online Training Transformation! Being fit makes me feel confident, powerful, energized and healthy. I also enjoy the genuine camaraderie at the gym. I have chronic low back pain so my #1 goal is to build strong glutes and legs. I’m learning it’s a process, but I can tell you my low back pain is rarely an issue now. This still remains my #1 goal. Julie Lohre and I are working on building muscle all around while losing bodyfat. I work full time so I am up around 5:00 am getting ready for my work day at the hospital. After work, it’s off to the gym and then home to spend time with my husband and our fur babies. My family history of obesity, diabetes, and heart disease quite honestly. Many of my family members are obese, hypertensive, have coronary stents, and diabetes. I feel like excess weight contributes to a lot of their co-morbidities. I may not be able to control the genetic component of some of these disease processes, but I can control what I eat and get my body moving. Julie Lohre’s genuine personality is the best part because she truly cares about you as a person, not just as a client. She gets it. She has been there. When I have a hiccup, she acknowledges it, holds me accountable, and gives me strategies on how to be proactive when the situation arises again. Also, she and her husband, Rick, host a free professional fitness photoshoot that I highly recommend her clients take advantage of. It is top notch! Not having her here in person. Julie’s muscle oats made with Ultimate Muscle Protein protein powder. I have these on hand at all times.